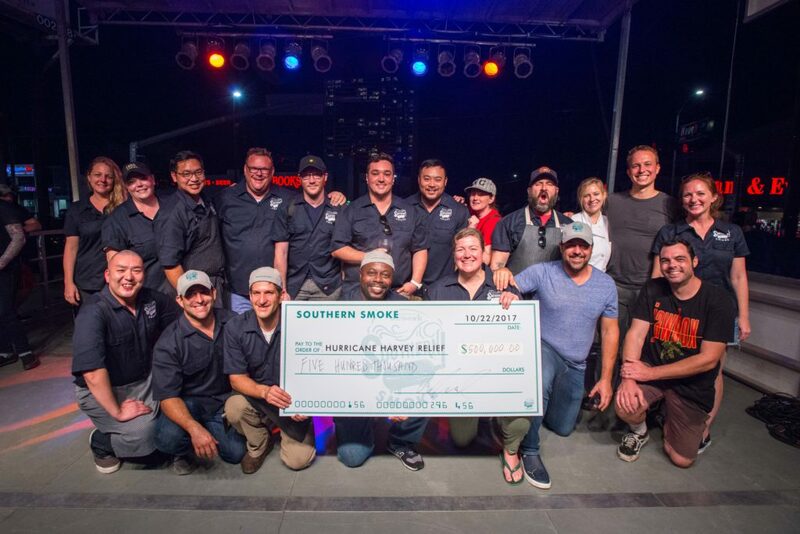 Southern Smoke, spearheaded by James Beard award winning chef Chris Shepherd raised over $500,000 for Houston Harvey relief in 2017. Photo by Catchlight Photography. Hurricane Harvey damaged the livelihoods of many Houstonians. Among the affected were people who work in bars, restaurants and hotels. Many in those professions live paycheck to paycheck, exist on a minimum wage of $2.13 per hour plus tips and have no insurance or other benefits. Needless to say, they’re among those least able to recover without help. Some got needed assistance this year from the annual Southern Smoke festival, which normally raises money for the Multiple Sclerosis Foundation. This year, organizers say the big event raised $501,000 that has now been distributed to 139 hospitality workers. 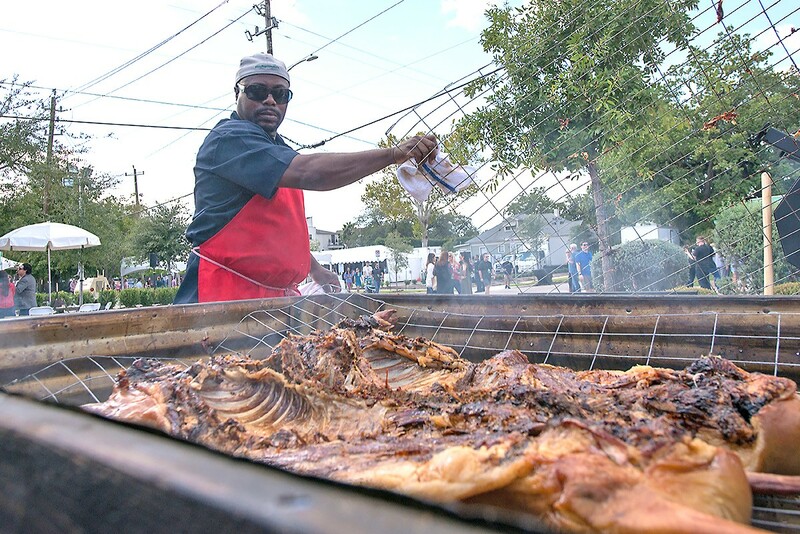 As with all big endeavors, the Southern Smoke festival on October 22 took hundreds of volunteers and donors to pull of the feat. The group of chefs loosely organized as the HouBBQ Collective (Chris Shepherd of Underbelly and One Fifth; Ryan Pera of Coltivare and Revival Market; Justin Yu of Theodore Rex and Better Luck Tomorrow; and Seth Siegel-Gardner and Terrence Gallivan of The Pass & Provisions) functioned as the core around which many other Houston chefs and volunteers came together to help with event. Many notable out-of-town chefs traveled to Houston for the event as well, including Mike Lata and Jason Stanhope of FIG in Charleston, Rodney Scott of Rodney Scott’s Whole Hog Barbecue in Charleston, Ashley Christensen of Poole’s Diner and other restaurants in Raleigh, Aaron Franklin of Franklin Barbecue in Austin and David Chang and Matthew Rudofker of Momofuku. In addition, major sponsors WeWork, Knob Creek and Lexus threw in their support as well. 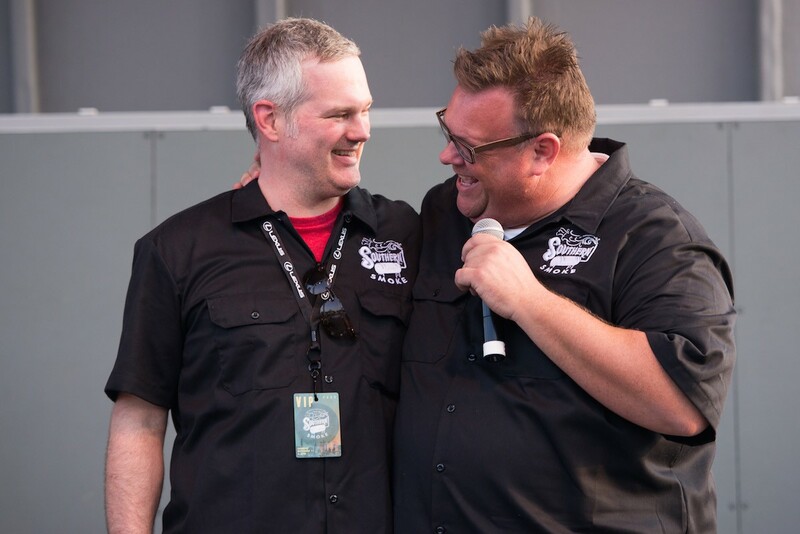 Rodney Scott of at the 2017 Southern Smoke festival. Photo by Catchlight Photography. A peripheral event called Wine Above Water, which also had an online auction of wines and unique experiences, contributed substantially to the fundraiser and generated more than $125,000 toward the final tally. The Southern Smoke Foundation partnered with another nonprofit, Legacy Community Health, and the latter group was in charge of distributing of funds. Of the 161 applications received, 139 were deemed eligible in a “blind” evaluation process. Eligible recipients—who lost homes, businesses, vehicles and wages to historic flooding—received checks ranging from $1,000 to $9,000. “It was no small task to pull off an event of this size, with this many moving parts, but it was so worth it to be able to give these checks to folks who really need it right now. This is why we created Southern Smoke—to take care of our own,” said Shepherd via a press release. Vahid Navissi, whose Café Benedicte was totally destroyed. Thanks to secure a few loans, some help from his landlord and a grant from Southern Smoke, he expects to reopen in February. Omari West-Griffin, a former waiter at Spaghetti Warehouse downtown. After his workplace was shut down after the floods, he lost wages and was evicted from his apartment. It’s also well worth noting that almost everyone in the list above are also parents of young children. So, now that this year’s benefit is over—and assuming there are no more disasters in the Houston area—what’s next for Southern Smoke? Shepherd says it’s back to the original purpose inspired by his former sommelier, Antonio Gianola. “The mission of Southern Smoke is to support our own, including, but not limited to, Antonio Gianola via the MS Society.” Gianola was diagnosed with MS a few years ago, and it’s not like that disease is going away yet. More work, research and funding is needed, so next year’s Southern Smoke is likely to be as ambitious and grand as ever.